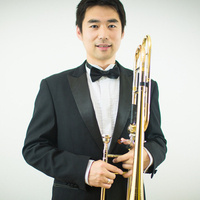 Guest artist recital; Dr. Li Kuang is an Adjunct Professor of Low Brass at Southwestern University in Georgetown, TX. He is an international, award-winning trombonist, having won awards at competitions like the 2011 International Frank Smith Trombone Solo Competition and 2014 American National Solo Trombone Competition. Dr. Kuang has recorded many commercial and movie soundtracks with the Sichuan Film Orchestra and has performed with other orchestras such as the Toledo Symphony Orchestra, Perrysburg Orchestra, Lima Symphony Orchestra, and Detroit Chamber Orchestra.